New Mexico has a long history of silver and gold mining. Lake Valley got its start as a mining camp when silver ore was discovered here in 1878 by cowboy prospector, George W. Lufkin. At about the same time, a rancher named Lou McEvers also discovered silver on his property and soon, they and others began to file a number of claims in the area. In 1880, McEvers sold his ranch and interest in his mining claims to a storekeeper by the name of John Miller. After trying his hand at mining, Miller found little success and soon sold some of the claims to a group of investors. Hiring men to dig a shaft, the investors found rich silver ore about 40 feet down and when word got out about the discovery, two mining stock promoters, George D. Roberts and J. Whitaker Wright, sent George Daly to evaluate the lode for a stock promotion in February, 1881. Daly was so impressed with the site that he bought all eight mining claims along the outcrop. J. Whitaker Wright joined Daly in April, and the two bought 8 more claims. The pair then headed to New York, where they partnered with a man named George D. Roberts and formed four mining companies, all run by another company called the Sierra Grande Silver Mining Company, located in Lake Valley. They also lured famed American paleontologist, Edward D. Cope into investing into the project, as well as becoming President of the Sierra Apache Mining Company and an officer in the other three companies. 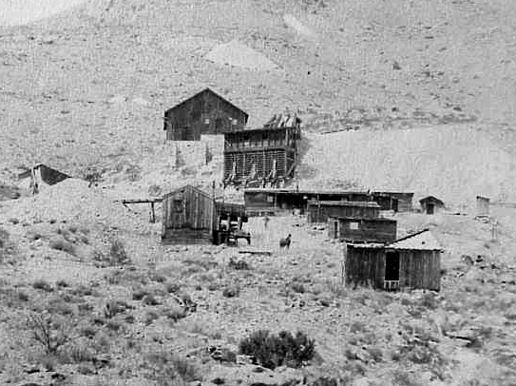 John Leavitt, who had taken a lease on a claim, owned by Daly’s company, had discovered a large subterranean room laden with silver ore that would later become known as the "Bridal Chamber.” Leavitt sold his lease to the Sierra Grande Company and mining began in earnest. When the ore assayed at $15,000 or more a ton, the stock promoters publicized it as the richest silver mine ever discovered and they soon sold five million dollars worth of stock in their Lake Valley mining companies. In just the first few months, over a million dollars in silver was mined from the Bridal Chamber and the Sierra Grande Company was paying out $100,000 a month in dividends. 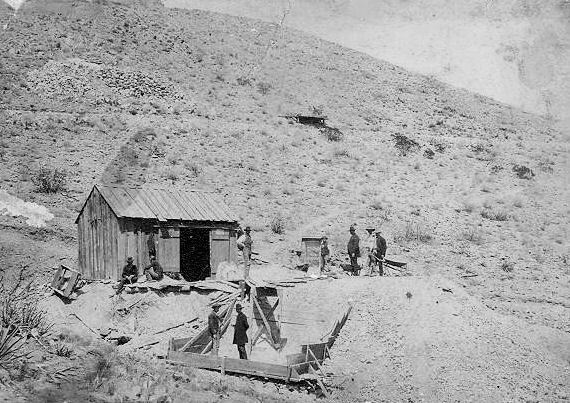 The silver laden Bridal Chamber Mine was played out by 1883 and by August, the Sierra Grande Company discontinued their management of operations in the Lake Valley area. Though the Bridal Chamber alone yielded $2,775,000 in ore, Sierra Grande shareholders lost money.Though the "original” Sierra Grande Company was out of business, other mines continued to be worked in the area and in 1884, the Santa Fe Railroad built a spur line to Lake Valley. 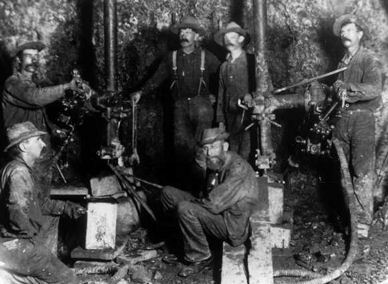 Mining operations continued until 1896 when the gold standard was implemented, silver prices plummeted, and the mines closed. By the following year, a tent city filled the entire canyon, the camp boasted seven businesses, including the Pioneer Store, and over 20 substantial houses. 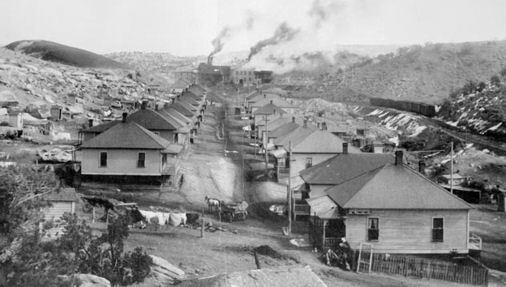 The mining camp was first called Pyetown, then Bromide before it took on its permanent name of Chloride. Chloride became the center of mining operations in the Apache Mining District and by 1883 was called home to some 3,000 people. 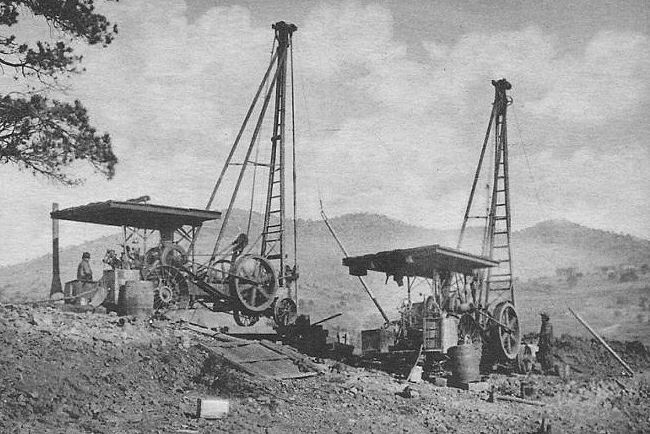 A number of mines were started including the Silver Monument, the largest and most productive mine, as well as the U. S. Treasury, the New Era, the White Mountain, the Wall Street, and several others. Like other mining booms throughout the West, Chloride’s life would be a short one. 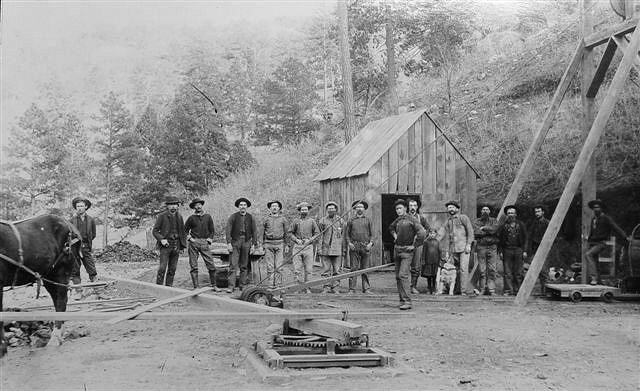 By 1893, the ore deposits were starting to play out and when, in 1896, the monetary standard was changed to gold, it spelled a death knell for the town. In 1879, prospectors found gold in the Jicarilla Mountains, near what would become the town of White Oaks. A tent city was established and a boom town quickly grew, supporting some 50 different businesses, including four newspapers, two hotels, three churches, a sawmill, a bank, an opera house, livery stables, and a number of saloons and gambling houses. In the meantime, prospectors, Jack Winters and Harry Baxter staked two claims called the Homestake Mine and the South Homestake Mine. The mountain where the gold was found was called Baxter Mountain. Eventually, the two gold miners sold their claims for $300,000 each. By 1890, the town's population had grown to more than 2,000, but at about the same time, the Homestake Mines were about to peter out. However, White Oaks was saved when another mine, called the "Old Abe” was developed, which employed large numbers of men and was immensely profitable. The town population soon reached its peak of about 2,500 people. 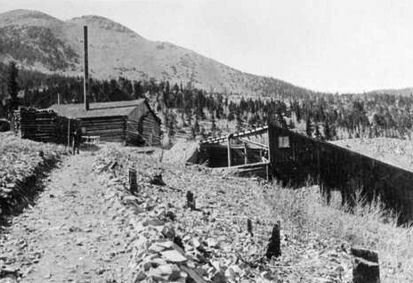 Of the many mining operations, the Old Abe Mine was the largest, employing some forty workers yielding between forty-five to fifty tons of gold ore per day. Other operations included the Robert E. Lee, the Smuggler, the Rita, Lady Godiva, Little Mack, Silver Cliff, Miners Cabin mines. All told, the mines of White Oaks yielded around $20 million dollars worth of gold. Coal mining in New Mexico has been vital during the past century. In a state where many regions are short of wood for fuel, it can be assumed that coal was used, but records have not been kept of the usage of so common an item. The army used coal during the Civil War, and even Texas ranchers were forced to bring in wagonloads of coal for fuel. The coming of the railroads between 1879 and 1882 put coal production on a firm footing. The first area opened was in Colfax County near Raton, and this district traditionally led the state in production. 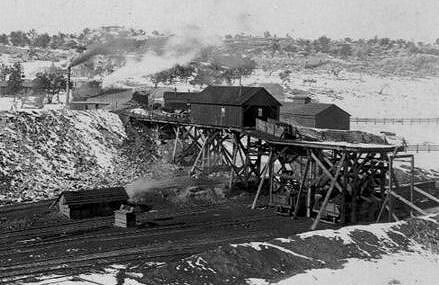 In 1882 the railroad reached Gallup, and existing mines in the neighborhood were promptly put into production to supply most of the coal used by locomotives en route to California. When coal mining was at its peak, the Raton field and the portion of the San Juan Basin near Gallup accounted for about 90 per cent of the state’s total coal output, although mines throughout the state were worked to supply local needs. 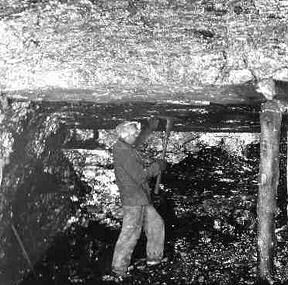 One example, mines in Lincoln County employed 300 men to produce over 120,000 tons of coal in 1902. 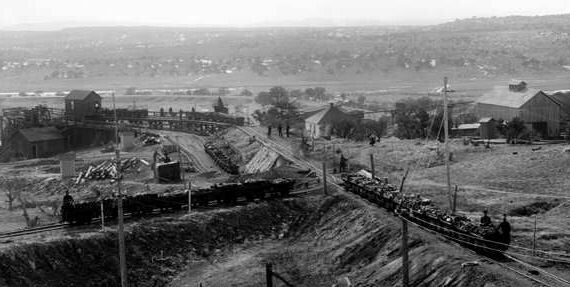 At its production peak, in 1918, the coal industry in New Mexico produced more than 4,000,000 tons of coal per year from sixty-one mines and employed 5,000 workers. Heaton, also called Camp Heaton, was a coal-mining company town in Heaton Canyon, about 3 miles northeast of Gallup. Its post office opened in 1909 and closed in 1922. The coal mine at Heaton was operated by the Gallup American Coal Company. The community was founded in the early 1900's, and was abandoned when the mine closed. Nothing remains of Heaton today as its buildings were moved to nearby Gamerco, which was also ran by the Gallup American Coal Company. Four miles west of Gallup, was once the small town of Mentmore, New Mexico. The town began in 1913, when the Dilco Coal Mine was opened by the Direct Coal Company. Originally the camp was also named Dilco, but whan a post office was established the name became Mentmore. 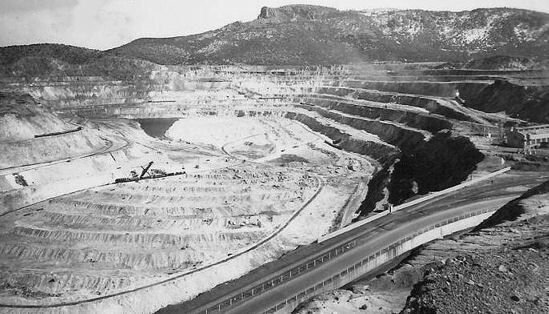 In 1918, George Kaseman of Albuquerque purchased the Dilco Mine property and the Morris Mine located a mile to the north. He combined the properties under the name of the Defiance Coal Company. When the mines closed at Mentmore in 1952, the town closed too. 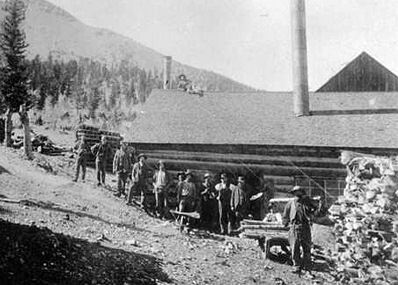 The opening of the Navajo coal mine by the American Fuel Company produced the camp of Navajo. Small frame houses were supplied to the residents by the company. A store and a hotel operated at the camp for a few years. About 1922, the Gallup American Coal Company sank the shaft at Gamerco, less than a mile west of Navajo, and the center of coal mining activity shifted there. 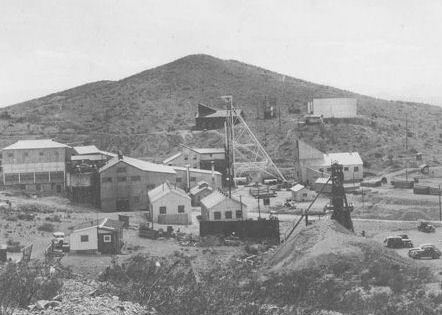 The Navajo Mine closed, but many of the miners stilled lived in the camp while working at Gamerco. The Gallup American Coal Company began sinking shafts into coal deposits north of Gallup in 1920, and two years later the newly formed camp of Gamerco witnessed hoisting of the first coal. Even before mining was underway the town was platted, and the Gallup American Coal Company moved abandoned homes from Heaton, and Navajoe, both nearby coal camps ran by the company, to Gamerco, in addition to new ones that were being constructed. In the 1960’s, the mines were closed and Gamerco died. Allison, New Mexico, located on a coal belt just northwest of Gallup, once flourished as a coal mining camp. The mine was first opened by a man named Gus Mulholland and later worked by Andrew Casna. However, when Casna was killed at the mine, presumably by Indians, his aggrieved widow fled to Germany. Her failure to keep up the development work necessary to retain her husband's claim resulted in a filing on the mine site by F. J. Allison and W. A. Patching in 1897. It was then that the town took its name for F.J. Allison. Allison was a company-owned town like most of the others in McKinley County. Employees lived in the small frame homes provided by the Diamond Coal Company. Allison was a company-owned town like most of the others in McKinley County. Employees lived in the small frame homes provided by the Diamond Coal Company. The town reported a population of five hundred in 1922, a company store, a meat market, post office, school, doctor and a sheriff. During its heyday Clarkville was an important lignite coal mining camp operated by the Clark Coal Company. The camp, founded in 1898, was named for its owner, W.A. Clark, a well-known Butte, Montana mining magnate. The mine was equipped with an electrical plant and a ten-ton electric locomotive that propelled the coal cars. Telephone connections ran between the mine and the town. In 1905, Clarkville had 400 residents, but two years later it had decreased to 200. 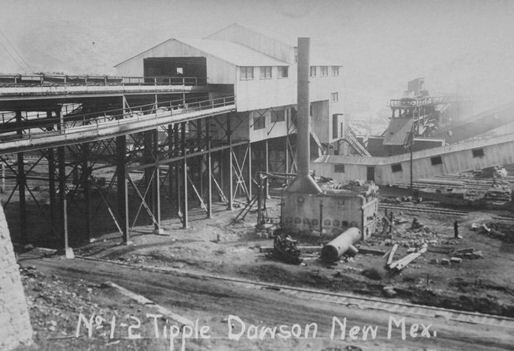 Dawson, originally a mining town founded in 1901 when rancher John Barkley Dawson sold his coal-rich land in northern New Mexico to the Dawson Fuel Company. The Dawson Railway was built connecting the town to Tucumcari, New Mexico. The mines were productive, and by 1905 the town boasted a population of nearly 2000. In 1905, 124 coke ovens were belching fire and the town of Dawson was thriving with about 2000 residents and numerous businesses. 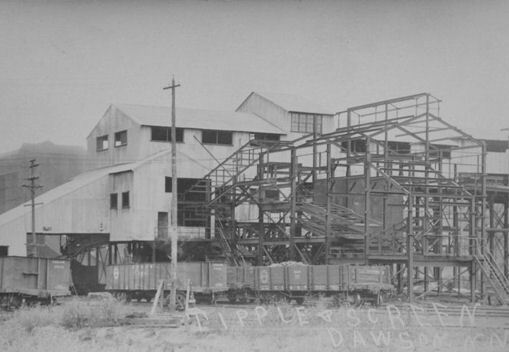 In 1906, the mines were purchased by the Phelps Dodge Corporation. The corporation needed to attract workers to the remote location, so they built homes for the miners, along with numerous other facilities including a hospital, department store, swimming pool, movie theater, and a golf course. With these amenities, Phelps Dodge was able to maintain a stable employment rate despite the inherent dangers of mining and the isolation of northern New Mexico. In total, the Dawson coal operations had ten mines, numbered 1 -10 in the immediate vicinity of Dawson. 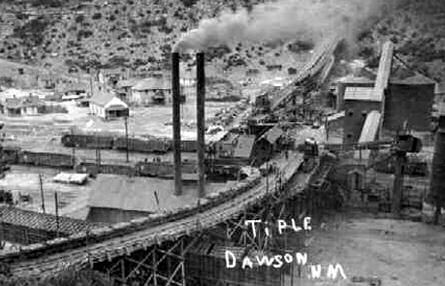 In 1913, Stag Canyon No 2 Mine at Dawson, New Mexico was the 2nd worst coal mining disaster in U.S. History, claiming 263 lives. Dawson did not become a ghost town until 1950, when the Phelps Dodge Corporation shut down the mines. At closure, Mine 6 was the largest producer, and several other mines had been previously closed out because of declining demand. 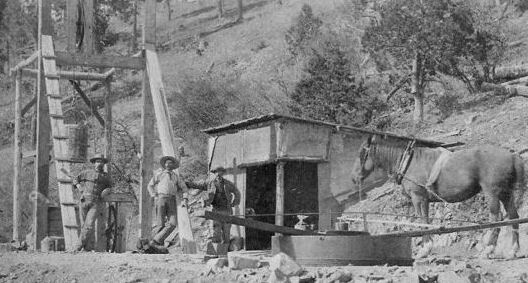 The first uranium production in New Mexico was a minor amount of autunite and torbernite mined circa 1920 from former silver mines in the White Signal district, about 15 miles southwest of Silver City in Grant County. New Mexico was a significant uranium producer since the discovery of uranium by Navajo sheepherder Paddy Martinez in 1950. Uranium in New Mexico is almost all in the Grants mineral belt, along the south margin of the San Juan Basin in McKinley and Cibola counties, in the northwest part of the state. Stretching northwest to southeast, the mineral belt contains the Chuska, Gallup, Ambrosia Lake, and Laguna uranium mining districts. Uranium mining in New Mexico was a significant industry from the early 1950s until the early 1980s. Although New Mexico has the second largest identified uranium ore reserves of any state in the US (after Wyoming), no uranium ore has been mined in New Mexico since 1998. The Chino Mine is an open-pit copper mine located near Silver City, New Mexico. 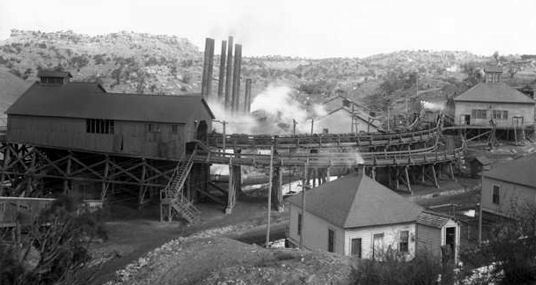 The mine, located in the town of Santa Rita, 15 miles east of Silver City, began life as the Chino Copper Company in 1909, started by mining engineer John M. Sully. The huge open-pit mine was once the largest in the world and is perhaps the oldest mining site still being used in the American southwest. Apaches, Spaniards, Mexicans, and Americans have all obtained native copper and copper ore from this site. 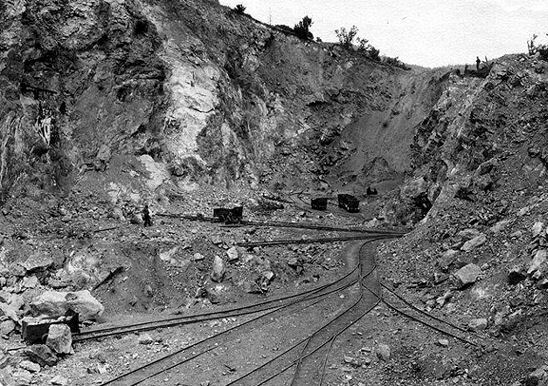 The present-day open-pit mining operation was begun in 1910. It is the third oldest open pit copper mine in the world after the Bingham Canyon Mine in Utah and the Chuquicamata Mine in Chile.